A water feature can be a nice addition to every garden. Besides, if you add some color and motion, you can create an exquisite attraction which is going to become the focal point of your garden. In case you haven't guessed it yet, please find out that we are talking about a fish pond. Whether you are a homeowner wishing to create a pond in your own garden or you are a landscaping specialist who uses to dig water features by hand, you should be aware that you can hire a mini digger to ease your work and speed up the process. These diggers are available for as little as £50 per day. The earliest fish ponds known date back to the third century. These water features originated in Japan and they were created with the purpose of being a food source. Later on, they have become decorative elements of Japanese ornamental gardens. 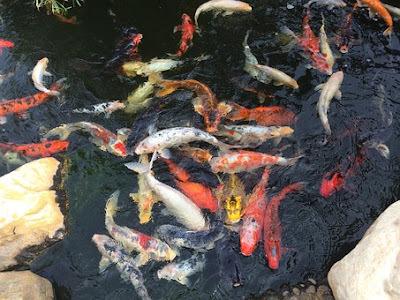 Today, many professional landscaping gardeners use a fish pond to turn an otherwise mundane garden into a charming one. Thanks to advanced technology that makes it easy to insulate such holes, this "water feature with life" has become one of the most desirable landscaping elements. Large fish ponds are difficult to dig manually, so you should take a look at available mini diggers for sale. Of course, you can always rent one, which is fairly affordable. They are also very easy to operate and extremely efficient, thus enabling you to progress much faster. Such a machine is able to dig a large hole in very little time. Besides, their compact size enables these machines pass through a narrow space between the wall and the fence of a property. You'll also need a skip to get rid of the excavated soil. With these two pieces of equipment, you can dig very large pond holes quickly and without any manual shoveling. If your plans for this spring include digging a pond, you should consider renting a mini digger, as it provides an excellent value for money. Mini diggers may vary a lot in terms of bucket size and functionality. You have to determine the right type of machinery for your specific project, as this would enable you to come up with accurate budget estimates. Moreover, you have to consider the amount of workload you'll need your digger to do, as this would enable you pick the right equipment for your job. If you get a machine that can't handle the amount of stress required by your project, you may damage it. By knowing what type of digger you need and for how many days you'll have to hire it, you're going to be able to come up with an accurate budget estimate. It is important to be able to secure the funds needed to complete your project from start to finish, so you should know exactly how much each operation is going to cost you. It's a good idea to ask for a detailed inspection of the equipment before hiring it out. You have to make sure your mini digger is going to run smoothly, at the expected operating standards and without any glitch. You might also want to ask whether one of the employees could try the mini digger before you hire it, in order to make sure it doesn't have any mechanical defects.